Do you really need a petticoat? Can you go without one? Should I choose a crinoline bridal slip or hoop slip? How wide should it be? Let's see if I can sort this out for you. Do You Really Need A Slip? Do you really need a bridal slip if you have one built into the gown?" The answer is... Maybe. Most wedding gowns, especially the high end designers, have a built-in crinoline petticoat. Some attached slips are full enough without needing an additional slip. How do you determine if the attached slip is enough? When trying on a wedding gown at the bridal salon, try your bridal gown on with a petticoat and then without one. If your dress doesn't look any better to you with the slip... then you don't need another slip. Most wedding dresses will look better with an additional slip. Here are some tips that will help you know whether you need a wedding dress slip. When you have your dress on without the bridal petticoat under it, you need a slip. If your underwear and/or bottom of a longline strapless bra shows through. A slip will conceal this. If it looks like the skirt of your gown is pleating more than you remember the designer's catalog picture, then you need a slip if that isn't the look you want. If your dress is caving in or creasing in the skirt center front. If your gown hemline should be smooth and flat, but it has folds and pleats in it. If when you walk you feel the gown or the wedding dress crinoline slip caving between your legs. This will make your dress skirt crease in the center front. If you have a ball gown and you want that very full bouffant look to your gown, to hold its shape. If none of these things apply... then you don't need a slip. But it you feel you do, here are some tips on how to choose one. Usually a lining layer next to your legs and a liner covering the net, but not always. The liner can have a ruffle or more in it to give more fullness to the slip at the hem. Some even have a hoop running at the hem to help it hold it's shape. How do you choose the right width slip to go under the wedding dress? It depends on how wide your wedding gown is. If you are in a bridal shop the sales person will usually pick the right one you need. You can try it on and then decide if you want something smaller or bigger or none at all. But say, you decide that you want to order one online because the bridal shop slip is to expensive. Or perhaps you ordered your wedding dress online and now you need to order a slip as well. How do you determine which one to purchase? How Wide Of A Bridal Slip Should You Get? Measure the bottom of your dress. Measure the front hem from side seam to side seam. Now if your gown has a built in slip and you only need a little extra width, then you can't go exactly by the measurement. You should get a slip a little smaller in width circumference. If your wedding gown doesn't have a slip built in, you would have to get a much fuller slip to achieve the right look you want. For a ball gown, princess wedding dress you usually will need a mega full slip if your gown doesn't have a slip attached. "Actually... It is good that wedding dress designers don't add the full amount of petticoat slip to the gown that it needs? Why? Because it would make the gown too heavy. A heavy bridal gown will slide down, if it is a strapless gown, and a gown with straps or sleeves, will cause you discomfort because you will feel the weight on your shoulders." Usually hoops are made with any where from one to six rows of bones in them. The higher the bones start near the waist the more the dress will round out at that point. The bones are adjustable to make the width smaller when needed. 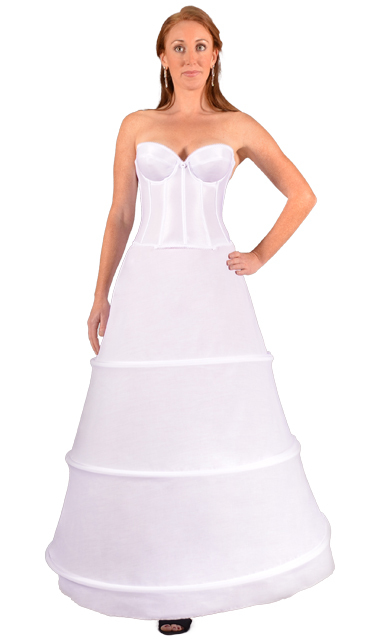 Hoop boned slips work best with a medium to full wedding gown. One tip... you can't have to much of a drop-waist on the bodice of your gown, if you use a hoop slip that starts high on the hip. Pros: Some like these slips because it's not up against their legs. Also, it's lighter than a crinoline, which tends to be heavy. Cons: Some don't like about a hoop slip. The slight sway you feel and sometimes see when you walk. Also, when you sit the boning doesn't bend easily and tends to jut out away from you. Remember Scarlet O'Hara in Gone With The Wind and the school teacher in the movie The King And I, how when they set down the slip would kick the gown up. They had on hoop slips. The boning used now is more bendable, but will kick out some. To help tame the sway and the jutting out when you sit, it is best to wear this type of slip with a heavy dress that has a crinoline built-in. What you also need to determine is the final shape you want your gown to fall in. Some slips start to flare out at the hip level.Other slips start flaring from the waist and/or upper hip/abdomen level, giving more of a pouf from the top, like a bell shape. If you want your dress not so puffy at the abdomen and hip level, but flare out more at the hem, then you need to buy a slip that falls in an A-shape, with ruffles on the bottom edge of a bridal petticoat. Ball gown style wedding gowns flare anywhere from the natural waist to high hip area. For Fit and Flare styles you need to note where your dress flares and make sure the flare on the slip starts below that point. The true mermaid usually starts flaring around the knee. The trumpet style flare out higher about the thigh area. Wedding Slips -Tips Based On My Experiences! The drawstring waist is the most adjustable. For the other closures, you need to measure your waist and order the size according to the measurement. The spandex waist is the least bulky under the gown. The cinched waist style bridal slip is one the bridal shops favor. But during gown fittings I notice that brides tend to complain more about being hot when wearing this type of slip. It adds another thick layer over or under a longline strapless bra. For some the extra fabric makes an already snug fitting gown, unbearable to wear. I prefer a slip that stops at the waist when using a longline strapless bra or corset. Petite Brides: Some companies offer petite bridal petticoat slips or will make custom lengths for a small fee. It is good to take advantage of this feature if you have height issues. Otherwise, you will have to have your slip shortened which will add to your alterations costs. Tall Brides: If you are tall, 5' 10" or above, then the slip bottom will not hit your gown in the right place and cause it to flare at a higher point than it is suppose to. 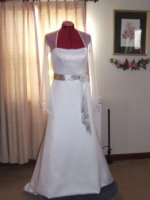 "The above information is based on many years of experience working with brides in my wedding dress alterations business. Hopefully... the tips and advice mentioned here will help you when picking out your bridal slip for your perfect wedding dress!" The Best Place To Buy A Bridal Petticoat? When you buy your gown at the bridal salon, usually you will have help picking a slip for your gown. But if you purchase your gown online or from another source, you have to figure this out yourself. There are online shops you can purchase a slip through. You can check out my online slip shop. You can also contact me for a slip consultation if you need help selecting a slip. How are you suppose to figure out which is best? Are the cheaper slips with less netting from the offshore wholesalers going to do the job of the more pricey voluminous netted slips? The answer to this is no! The slips with less net will not hold the shape you need for your dress the whole time you will wear it. Bridal petticoat crinoline slips that are made here in the USA are made out of quality net and are flame resistant. They are engineered to hold the desired shape needed and that is why they have layers and layers of ruffled net and some styles have ruffled taffeta toppers to give extra fullness. The cheaper offshore slips are made with inferior netting that sometimes is so crumpled when you get it that you cannot fluff them out properly. And some have complained of a strange odor coming from them, something very undesirable. Remember the phrase... "You get what you pay for!"